Led by their Commanding Officer Major George Preddy, the P-51 Mustang pilots of the 328th Fighter Squadron engage in a bitter struggle with Luftwaffe fighters in the cold winter air high over eastern Germany. They have been escorting B-17 Fortresses attacking the heavily defended synthetic oil plant at Merseberg, November 1944. 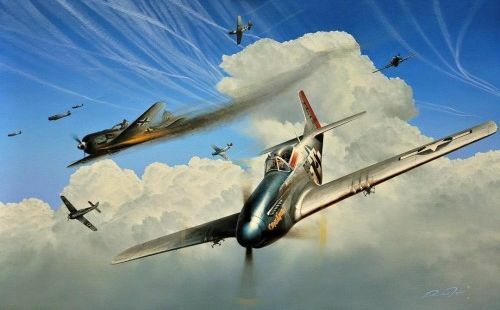 As the B-17s turn safely towards home above them, Preddy skilfully manages to down one of the attacking Fw190s in the ensuing melee.